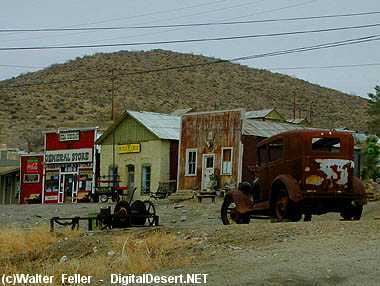 Desert ghost towns are ghost towns simply for one reason; money. If the money isn't there, there is no reason for people to stay. In the areas where resources such as water are available, contemporary communities have developed. In the Mojave, these population centers evolved from springs along trails and later roads, into transportation hubs, waystations and centers, sometimes obscurring or building over historical consequence. Old mining camps that have lost most of their population at some stage of their history, are sometimes included in the category, although they are active towns and cities today to various degrees. Shoshone and Randsburg are a good examples of this. Some ghost towns such as Calico and Bodie are tourist attractions preserving architecture (more so Bodie). These towns exist in a protected state, with Calico, a nearly pure tourist attraction, makes money. An attempt to declare an "Official Ghost Town" in California collapsed when the supporters of the town of Calico, in Southern California, and those of Bodie, in Northern California, could not come to an agreement as to which of their favorites was more deserving. As a compromise, Calico is the official silver ghost town, while Bodie takes the gold ghost town designation.